Chilean sea bass is a flavorful fish that makes for a healthy meal. Fish is generally low in calories and an excellent source of protein and omega-3 fatty acids. Omega-3 fatty acids help fight inflammation in the body. This healthy recipe by Chef Edgardo Llopiz Rivera, executive chef of the Café at Miami Cancer Institute, was served at this year’s Hispanic Women of Distinction luncheon. “It’s easy to prepare, healthy and delicious,” Chef Eddie says. The tropical salad to accompany the sea bass includes black beans and quinoa. Eating beans may help lower blood pressure, prevent inflammation, manage diabetes and can play an important role in weight loss. Quinoa is also very nutritious. It’s high in fiber, protein and antioxidants, gluten-free and has a low glycemic index which can help control blood sugar levels. In a mixing bowl, mix all ingredients except for the avocado. Fold the avocado into the mixture. On a greased grill, cook the sea bass 3-4 minutes on each side. Serve fish with black bean and quinoa salad on the side, or enjoy together in taco shells or over rice. Nutritional information (per serving); Calories 512, Total fat 27g, Saturated fat 6g; Cholesterol 70mg; Sodium 534mg, Carbohydrate 36g; Fiber 7g, Sugars 12g, Protein 35g. 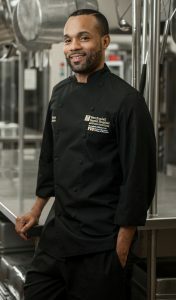 Edgardo (Eddie) Llopiz Rivera is the executive chef of The Café at Miami Cancer Institute. He and his culinary team at Baptist Health won the Miami Marlins Foundation 2016 Taste of Miami Food & Wine Best of Show Award. Chef Eddie has worked alongside award-winning celebrity chefs Daisy Martinez, Adrianne Calvo, Cindy Hutson and LeRoy Bautista. His passion for cooking began as a teenager cooking with his mother for a homeless community at a neighborhood church. After attending the French Culinary Institute in New York City, Chef Eddie began his career at The Grand Havana Room, a private club where he cooked for celebrities including Alec and Steven Baldwin, Lawrence Fishbourne, Tommy Mottola and Lisa Ray. In South Florida, he has served as chef at Morton’s Steak House, Angelique Euro Café and Shula’s Hotel and Golf Club.